The leaders of Italy's populist coalition parties are sparring over migrants stranded at sea aboard private rescue vessels. Spain's maritime rescue service says a baby has died despite efforts by rescuers to save it after a small boat carrying migrants sunk in the Mediterranean Sea. The death came as over 500 others were... rescued. Army says all 38 other passengers rescued from boat trying to reach Europe A child has drowned after a boat carrying 39 migrants trying to reach Europe capsized off the northern coast of Lebanon, the... army has said. All other passengers were rescued off the coast of Akkar province, the army said, claiming that the Syrian migrants were being smuggled to Cyprus. EU high representative refuses to give backing despite threat to pull plug on rescue mission A call by Italy for France and Spain to offer up their ports for the disembarkation of migrants rescued in... the Mediterranean has failed to garner the backing of EU member states, despite Rome's threat to pull the plug on the EU's Operation Sophia rescue mission. Hijacking a meeting of defence ministers in Vienna, the Italian representative, Elisabetta Trenta, called the ports where rescue ships dock to be rotated to lift the burden on her country. Italy's government had refused to allow the migrants off a rescue ship in Sicily for almost a week. High commissioner for refugees urges other countries to take in the asylum seekers, stuck on a boat off Sicily for the past week The United Nations has urged European countries to "do the right thing"... and take in some of the 150 refugees and migrants who have been trapped for days on an Italian coastguard ship after the government refused to let them disembark. "The time has come to end the back-and-forth that has seen countries competing in a race to the bottom on who can take the least responsibility for people rescued at sea," the UN's high commissioner for refugees Filippo Grandi said in a statement on Saturday. Ten European Union states meeting over their latest migration tussle in Brussels on Friday agreed no solution for disembarking Mediterranean migrants stranded in an Italian port, diplomats told... Reuters. Five European countries will take a share of the 141 people on board, rescued off Libya Malta has agreed to let the Aquarius migrant rescue ship dock in one of its ports and disembark 141 people... rescued off the coast of Libya last week, ending a European standoff over who should accept the ship. "Malta will be making a concession allowing the vessel to enter its ports, despite having no legal obligation to do so," a government statement said. More than 140 migrants rescued by an aid group as they drifted in the Mediterranean have claimed five ships passed them by without plucking them to safety. Blow to Italy as Tripoli snubs proposal to set up reception centres for migrants in Africa Libya has rejected a European Union plan to establish migrant centres in the country, adding that its... decision would not be swayed by any financial inducements. The formal rejection by the Libyan prime minister, Fayez al-Sarraj, is a blow to Italy, which is regarded as being close to Sarraj's Tripoli administration. 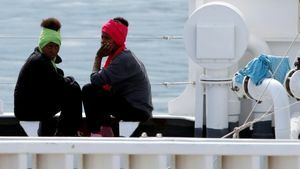 Italian prosecutors on Friday investigated alleged threats by some of the 67 migrants against a tugboat crew who rescued them at sea off the Libyan coast. Germany's hardline Interior Minister Horst Seehofer said talks would take place between the three nations on how to close the Mediterranean route into the EU. The vessel, run by Spanish humanitarian group Proactiva Open Arms, rescued the migrants, including five women, a nine-year-old child and three teenagers, off the coast of Libya. The resolution of a long and bitter debate over E.U. migration rules seems to have saved Angela Merkel and bolstered the power of Matteo Salvini in Italy. Britain has a responsibility to refugees and Brexit won't change that It's not Portsmouth or Dover where the Aquarius, the Lifeline and other rescue ships are attempting to dock. It's not happening in... Britain and Brexiters would argue that soon Britain won't even be part of the political union that has to deal with them. But Brexit does not alter our geography or international legal responsibilities of states towards refugees and migrants. As EU leaders meet in Brussels to discuss migration, it's in Britain's interest that the EU finds a solution and incumbent on Britain to do the right thing - on substance and rhetoric. 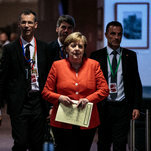 The Latest on immigration issues in Europe (all times local): 3:45 p.m. Malta's premier is telling a German aid group to reroute its rescue ship away from the Mediterranean island to avoid further... escalation of another European standoff over helping migrants. Hundreds of migrants who were turned away from seeking refuge in Italy arrived in Spain on Sunday, where the government recently unveiled a series of measures to "put the people's rights first."